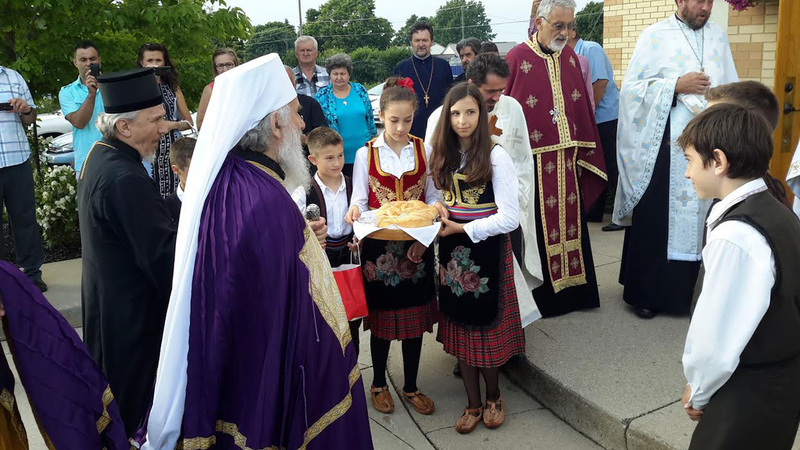 Waterloo, Ontario - His Holiness Serbian Patriarch visited the Serbian community and St. George Church-school congregation in Waterloo on Monday, June 22, 2015. 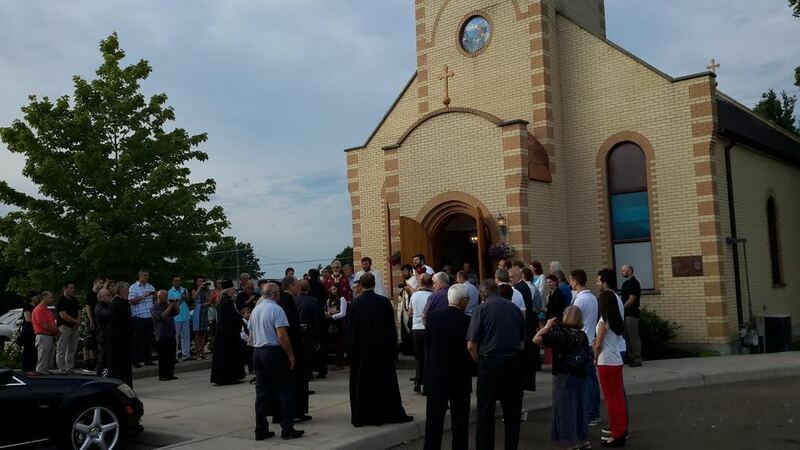 Also active in this parish is the Circle of Serbian Sisters "Protection of the Most Holy Theotokos", the "St. John of Damascus" Choir and "Gavrilo Princip" folklore group. In 1996 a regional "St. Sava" Serbian school was formed. In 2010 the "Kosovoski Zavet" youth group was formed. Milan Lesic, president of the St. George church-school congregation, greeted His Holiness and among other things said: "It is my honor and priviledge to welcome you to our church-school congregation on behalf of our board members, the Kolo Sestara, the folklore group, on behalf of all of us and in my own name as president of this church-school congregation. We have gathered at this beautiful place to welcome you and greet you, and to ask you to bless us and teach us. You are aware, Your Holiness, of our troubles and divisions with which we have be subject to for years. During that time there was hostility among brothers, kumovig and relatives, among friends and neighbors. Most of them weren't even aware why the one accused the other, why they hated each other and took each other to court. Thank God those times are behind us, even though other temptations have found us from which, thanks to Your Holines and the Holy Synod and Assembly of Bishops we are slowly being freed of. Your wisdom and love, Your Holiness, give us hope that this temptation has come to an end and we rightfully await better days that we might show that we are not a people of divisions and discord but a people of Christ, of St. Sava, of our holy and God pleasing ancestors, a people who build unity and communties. 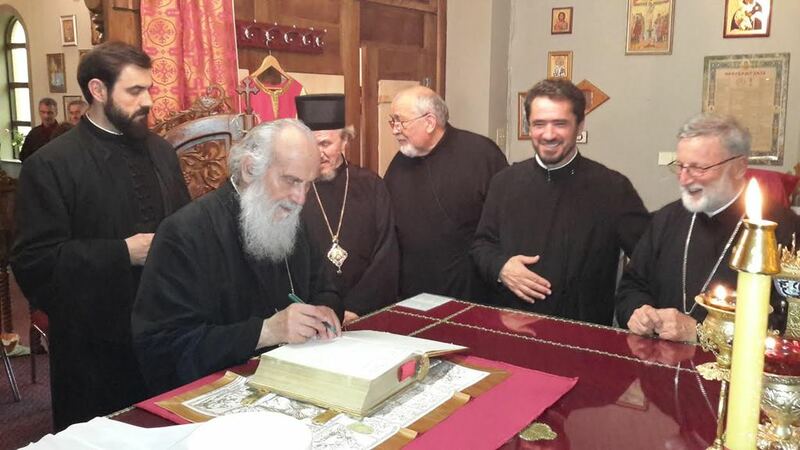 We assure you that we will do everything we can, as Patriarch Pavle, to correct the mistakes of the past and strengthen our Church in every aspect. For if we all do what we should and can, then God will help us. We hope that you, Your Holiness and our Holy Church, which you wisely lead, will be pleased with us and that which we do for our Church. Thank you for all that you have done so far that we not remain in our troubles. For showing us your fatherly love and helped us to overcome our troubles and problems. We are convinced that we will never forget your concern and fatherly care. Please feel like both our dearest guest but also like at home, for you are in your own land among your own. We wish and pray that God grant you strength and good health to lead the ship of the Serbian Church down the path left us by St. Sava, the path of Truth, Justice, Peace and Love. Many years!" The patriarch addressed the faithful.